The discovery of the tomb of Tutankhamun caused a sensation and raised the profile of Ancient Egypt with modern tourists and scholars. His tomb had been robbed at least twice before its discovery by Howard Carter but based on the items taken (including perishable oils and perfumes) and the evidence of restoration of the tomb it is likely that these robberies took place fairly soon after the pharaoh's burial. The tomb was probably saved from further incursions because its entrance was buried under debris and chips of stone excavated during the construction of other tombs (in particular KV 9 the burial of Rameses VI) and washed there during the infrequent floods which occasionally swept the area. It also seems that worker's accommodation was built above the location of the entrance during the Rameside period implying that the Egyptians themselves did not know there was a tomb beneath them. Tutankhamun's tomb escaped the systematic clearance of tombs in the area conducted during the Twentieth Dynasty motivated in part by a desire to re-house the mummies of pharaohs in a few locations so that they could be better guarded and in part by a rather less worthy desire to recycle their precious grave goods. Thus because Tutankhamun was not included in the Abydos kings list, and his tomb entrance was lost below rubble and later habitations, it was relatively intact when it was re-discovered. Theodore M. Davis and his team uncovered a small site (cache of Tutankhamun - KV 54) containing funerary artefacts bearing the cartouche of Tutankhamun in 1907. Shortly after he excavated the tomb of Horemheb (KV 57) which he assumed was also the tomb of Tutankhamun. In his book detailing his findings ("The Tombs of Harmhabi and Touatankhamanou") he famously states "I fear that the Valley of Kings is now exhausted". He was, of course very wrong. Howard Carter was employed by Lord Carnarvon to search the area for any remaining tombs, but he did not narrow his search to the Tomb of Tutankhamun until he was running out of time. Carnarvon had made it clear that he would only fund one more year of excavations when Carter struck gold with his discovery of the tomb in 1922. The tomb of Tutankhamun was one of the smaller tombs of the Valley of the Kings as Tutankhamun was a fairly minor king who had a very short reign. The tomb is located in an area not usually associated with royal burials perhaps because it may have originally been intended to be the tomb of his Vizier, Ay. It is suggested that KV 23 or KV 25 (in the West Valley of the Kings) may have originally been intended for his use but as these tombs were unfinished Tutankhamun was buried in KV 62 and Ay later took KV 23 after succeeding Tutankhamun as Pharaoh. Despite its small size, the tomb was crammed with beautiful artefacts, leading many to speculate on the wonders that would have been placed in the tomb of a pharaoh such as Ramesses II or Thuthmosis III. Over three thousand five hundred items were recovered from the burial of Tutankhamun, and many are breathtaking in their beauty and a testament to the skill of Egyptian craftsmen. However, it is now thought that more than half of the jewellery had been stolen from the tomb before it was opened by Howard Carter. 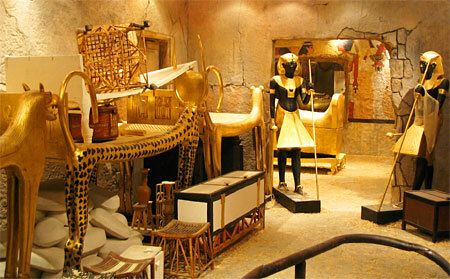 The tomb does not follow the design of the other pharaonic burials of the time. However, Howard Carter suggested that the layout, although apparently different from that of other New Kingdom tombs, replicated the lower sections of more traditional royal tombs. Sixteen steps descend to a sealed and plastered doorway (often erroneously alleged to be the location of the Curse of Tutankhamun). Beyond this doorway a single descending corridor led to a second sealed door and a rectangular antechamber with a small chamber leading off from the west wall. The doorway in the north end of the antechamber leads to a small burial chamber, the floor of which is around a metre lower than that of the preceding chamber. Another annex (the treasury) extends from the east wall of the burial chamber back towards the entrance. The Dead Sea Scrolls are widely considered one of the greatest archaeological discoveries of our time. A priceless collection of 2,000-year-old documents that shed light onto a little-known period in religious history, the scrolls are some of the oldest surviving written documents in human history. 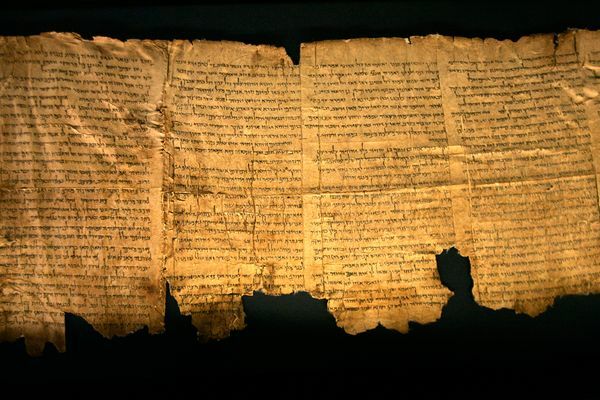 Containing original texts from the Bible as well as writings that tell us about the laws and society of Jewish culture, the scrolls were discovered in a cave along the northwestern shore of the Dead Sea in 1947. Since then, they have prompted rigorous scholarly debate as to who their authors may have been, and they've given us a rare glimpse into what life was like around the time of Christ. Don't miss your chance to experience this moving, engaging exhibition—one you'll always remember. And as a part of your visit, you'll also see the newest handwritten Bible—The Saint John's Bible—on display in the final gallery, and learn about a tradition that continues to the present day. During Afghanistan's civil war in the 1990s, the National Museum outside Kabul was literally on the front line, repeatedly attacked by rocket fire and looted by warlords. Then, during the reign of the fundamentalist Taliban regime, all non-Islamic statues and tombs were ordered destroyed. This led to the loss of two-thirds of the hundred thousand items in the Kabul museum. The Taliban was forced from Kabul after the U.S. military intervention in Afghanistan in late 2001. Before then, the Taliban's culture minister supervised the destruction of many of the remaining exhibits at the museum. The Afghanistan government found the hidden treasure boxes in 2003 and made the announcement on August 25, 2003. It quickly asked for international assistance in conducting an inventory of the artifacts. The work was done in April, May, and June of that year. Earlier this year a safecracking at a presidential palace vault in downtown Kabul revealed that the entire trove was intact. Now an inventory project funded by the National Geographic Society has catalogued the more than 22,000 objects. The collection includes exquisite ivory statues and 2,500 years' worth of gold and silver coins. The discovery is a ray of hope in the quest to restore Afghanistan's cultural heritage, most of which has been destroyed forever by decades of war and looting. "By the end of the Taliban's reign, most of us thought there was nothing left—just destruction and despair," National Geographic Fellow Fredrik Hiebert said. Hiebert led the inventory project with support from National Geographic and the U.S. National Endowment for the Humanities. Perhaps the most important of the lost treasures were the famed Bactrian gold pieces, great icons of Afghanistan's cultural heritage. The hoard—discovered in the fall of 1978 by Soviet archaeologists—included more than 20,000 gold objects from the 2,000-year-old Silk Road culture of Bactria, an ancient nation that covered parts of what is now Afghanistan. The inventory that was done this year was led by Hiebert and a team of 18 Afghans, including museum director Omara Khan Masoodi, and U.S. scholar Carla Grissman. They made a full accounting of the entire collection, first describing each artifact in both English and the local Dari language, then photographing them, and finally repackaging the objects. Iraq regains gold earrings from the treasure of Nimrod .. After it was on the verge of selling in New YorkQuestions about how and access to the United States after having been saved in the Central Bank vaults24/08/2010 Treasures of Nimrud have displayed for a short time in the Iraq Museum in 2003 after the overthrow of the former Iraqi regime Baghdad : Huda Jassim, Washington: Mina Al-Oraibi London: «Middle East »- The Ministry of Tourism and Antiquities of Iraq Iraq's restoration of gold earrings dating to the time of the Assyrian ( 934-608 BC) after it was on the verge of selling at auction at Christie's in New York. Said Abdul-Zahra Tlghani , media advisor to the Ministry of Tourism and Antiquities , told «Middle East» It has been restored « gold earrings recently , part of the Archives of Iraq, has been auctioned off after the discovery of its presence in the United States » . 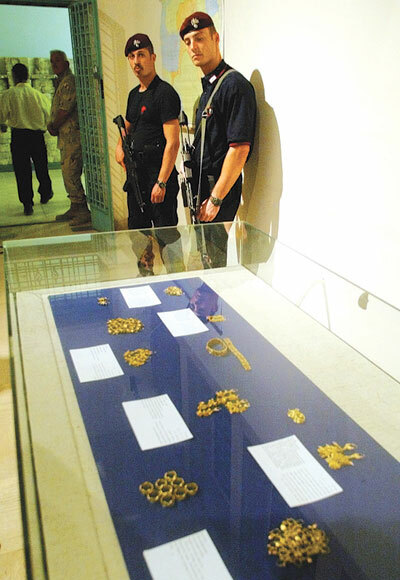 However, the Iraqi official denied knowing about how to access these earrings, which is one of the treasures of Nimrud , which keeps Iraq in the coffers of the Central Bank of Iraq, but he stressed that Iraq still retains a lot of archives , including the treasure of Nimrod « somewhere very safe » . The newspaper « Daily Telegraph » British pointed out that the artifact, dating to more than 3000 years , is one of the many antiquities that were stolen after the overthrow of former Iraqi regime. Remember the paper that the earrings are part of the treasures of Nimrud , amounting to about 613 pieces of gold and jewelry found in 1988 in two graves and return one for the Queen of Assyrian and one for the princess in the city of Nimrud archaeological capital of the Assyrians , in northern Iraq , where the city of Mosul and around today. And keep the former regime, this treasure the archaeological treasures of Central Bank of Iraq in 1991 during the Iraq war , which erupted after the Iraqi invasion of Kuwait, and since then has not presented this treasure anywhere, while the reports spoke Iraq that Sajida Khairallah , wife of former Iraqi President Saddam Hussein had been seen once , wearing a golden coins from the treasure . The newspaper quoted British Donny George, an archaeologist of Iraq and Chairman of the Iraqi antiquities before, before settling in the United States in 2005 , he distinguished those earrings , upon seeing me, and said that he took his own photographs of the objects, archaeological have found more than two decades of Time. Christie did not reveal the identity of the seller as he did not comment on the matter. It is known that « Department of Immigration and Customs » U.S. responsible for monitoring and recovery of stolen antiquities . According to the department responsible for the «Middle East » gold earrings that were returned to Iraq in the group of 6 Effects of the U.S. authorities have retrieved during the final months of last year and handed over to the Iraqi Embassy in Washington in February (February ) last year. The Assistant Director of « Department of Immigration and Customs » John Morton at the ceremony on time : « It is a great honor to restore to the Iraqi people on behalf of the American people, this group of cultural treasures that reflect the history of (Iraq), rich in history and civilization » . Recognized earrings, dating back to the eight decades before the date to the Iraqi authorities with a range of effects that were stolen from Iraq and were seized in the United States , including a Roman coin dating back to 250 years BC. And stresses the « Department of Immigration and Customs » continue its work to recover pieces stolen Iraqi , but there are problems in identifying the stolen objects , since a large number of them are already monitored . It is noteworthy that the Service is part of a wider process of the Ministry of « Homeland Security » U.S. to monitor the stolen items , which usually try to Sarkoha sold through auction to be held in New York , one of the most important centers of auctions in the world. This enormous complex construction (50 hectares) compound of palaces, gardens and lake was erected by two architects of emperor Nero, Severus and Celerus, after the fire of Rome in 64 A.D. and expanded from the slopes of the Celian and Palatine till the Oppian and Esquiline Hills. 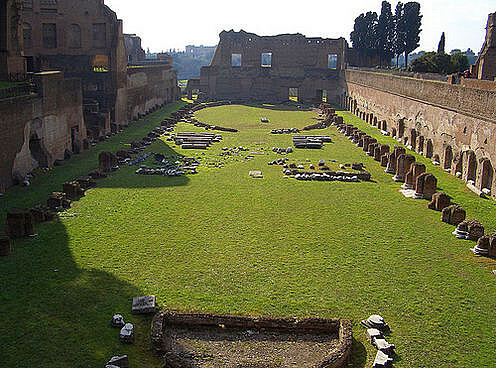 The main part of the palace was on the site of the Palace of Tiberius and Caligula (Palazzo di Tiberio e di Caligola) on the Palatine Hill; the gardens with the lake were in the valley now occupied by the Colosseum. Immediately after the death of tyrant, to who the fire of Rome was assigned, the huge area that was occupied by his patrimony was restored to the city. Domus Aurea (Nero’s Golden House) was the largest and most sumptuous of the imperial residences extending from the Palatine Hill as far as the Colle Oppio and part of the Caelius Mountain covering about one square mile. It included an artificial lake, gardens, and a wood. The architects were Severus and Celeris,while the paintings were by a certain Fabullus or Famulus. The rooms were finely decorated and enriched by many statues that came from Greece and Asia Minor. In 72 Vespasian obliterated the lake to build the Colosseum; Domitian built on the site of the buried palace on the Palatine his own palaces; Trajan destroyed the houses on the Oppian to build his baths; Hadrian built his Temple of Venus and Rome on the place of the vestibule, where formerly the statue of Nero stood, and moved it in front of the Colosseum. The remains of the Domus Aurea villa include a nymphaeum, with the vault mosaics, and a long cryptoporticus decorated with grotesques. Successively the Thermae Traiani were built on the Domus Aurea after filling in its rooms and plugging its accesses. The building of the Thermae allowed the conservation of some rooms of the Domus Aurea up to our times. Ever since its discovery during the Renaissance, many artists, who put their signatures high up on the walls where they can still be seen today, let themselves down into the caves of the underground rooms of the Domus Aurea to copy the paintings on the vaults by candlelight. The main core of the Domus Aurea consists of two pentagonal courtyards that act as a connection between the western and the eastern sectors. There is a large octagonal room between the courtyards with a pavilion vault that according to Svetonius revolved unceasingly day and night. Because of its underground position, the halls of the palace were explored as the caves or grottoes by the Renaissance artists (Pinturicchio, Ghirlandaio, G.da Udine), who imitated the strange paintings and forms of vegetables and animals found here in their own works, and gave the name to this kind of artistic style "grotesques" (it. "grottesche"). The walls were decorated up to a certain level with marble slabs now lost, while the upper part and the ceilings were decorated with paintings and stuccoes of mythical figures (Achilles and Scirus, Ulysses and Polyphemus, Hector and Andromache). The rooms are now dark and gloomy (all the openings having been plugged for the construction of the thermae rising above), but originally light was the predominant feature when all the rooms were open on the portico that offered a fine view of the valley with its artificial lake and the gardens that surrounded it. The famous group Laocoon was found here in the 16th century (now in Vatican Museums). Most of the rooms of the Domus Aurea had fresco, stucco and mosaic decorations. "Nero gave the best parties, ever," archaeologist Wallace-Hadrill told an interviewer when the Golden House was reopened to visitors in 1999 after being closed for years for restorations. "Three hundred years after his death, tokens bearing his head were still being given out at public spectacles - a memento of the greatest showman of them all." Nero, who was obsessed with his status as an artist, certainly regarded parties as works of art. His official party planner was Petronius. 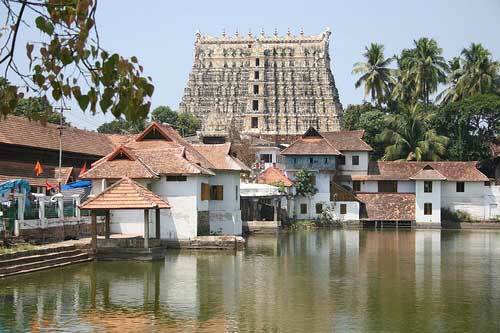 Kerala temple treasure is worth Rs 5 lakh crore? The valuables found in the secret cellars of Kerala's famous Sree Padmanabhaswamy Temple could be worth Rs 5 lakh crore, believes former chief secretary of Kerala CP Nair. As per a report, Thursday, the former bureaucrat claims that the estimated market value of the treasures unearthed from the temple makes it the richest temple in the world. Separately, R Ramachandran Nair, another former chief secretary, told reporters that articles, ornaments and other precious stones recovered from the temple are its exclusive property and no one has any right over them. “The Maharaja is the Trustee of the temple and hence the official custodian of the wealth. The royal family has not touched a single paisa from these offerings. 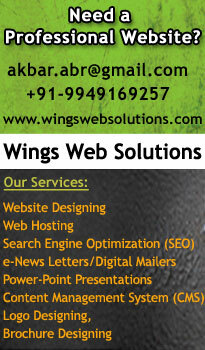 Neither the government nor the politicians can interfere with these offerings in any manner,” Nair added. Breaking its silence on the issue, the Kerala government has also declared that that the valuables belong to the temple and should be preserved there. However, a final decision in this regard would be made by the Supreme Court, which had constituted a seven-member panel to prepare a detailed inventory of the articles, valuables and ornaments found from the temple's treasure trove. The SC-appointed panel includes two former high court judges. Yesterday, the apex court had ordered the videography of the inventory and asked those involved in the exercise to desist from speaking to the media. So far, five out of the six secret cellars had been opened by the panel and the articles found from there have been duly enlisted. The decision on opening the remaining cellar would be taken on Friday after further discussions, sources from the temple said. However, members of the Travancore Royal Family have kept a low profile on the findings. 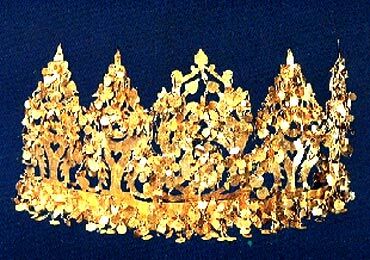 More than the value of the treasures unearthed, what is interesting is the strange ties the Royal family shares with Lord Padmanabha and the temple. All Maharajas who have ruled Travancore were known as Padmanabha Daasa (servants of Lord Padmanabha). Princess Gouri Lakshmi Bai, the niece of Uthradam Thirunal Marthanda Varma, the present title holder of the erstwhile Travancore State, said it was not proper to describe the findings in the chambers as treasure. “It is offerings made by the Lord’s devotees and hence it is his wealth. They are not treasures,” she said. Though the exact date on which the temple was consecrated is not known, there are official records dating back to 910 AD. “There are records indicating offerings made by Raja Raja Cholan and Krishna Devaraya of the Vijayanagaram Empire,” said Ramachandran Nair. Interestingly, the Padmanabha Swamy temple, which has a distinct Dravidian architecture, stands near an Arya Samaj office, where non-Hindus can get converted to Hinduism by paying a nominal amount of Rs 50, so that they too can worship in the temple.